I love the use of those delicious ranunculous against the roughness of the straw wreath. Like fresh eggs in a nest. So pretty! 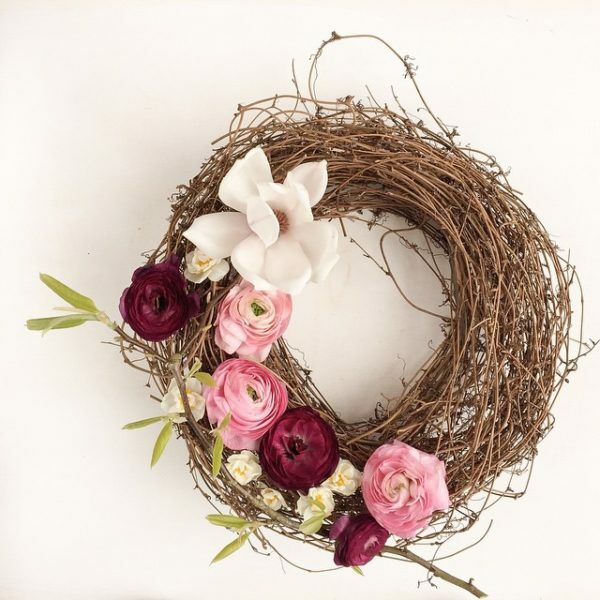 This wreath would make a perfect addition to any home. Imagine it above a bed…. ooooo! Over on my Instagram feed you will find this weeks favourite eight (#natureinthehome8), thank you all who have joined me this week and every week, it’s just such a lovely thing, seeing such beauty popping up on my feed. #natureinthehome has now reached over 8000 entries! WOW! Next week it’s going to be extra special, as it’s May Day. Friday 1st of May, is when we get to give thanks to our friends and neighbours by hanging a May Day posy on their door. I hope you will join me. More details coming soon. #NITHMayDay. Stunning wreath and captured beautifully. Off to check out the instagram now!